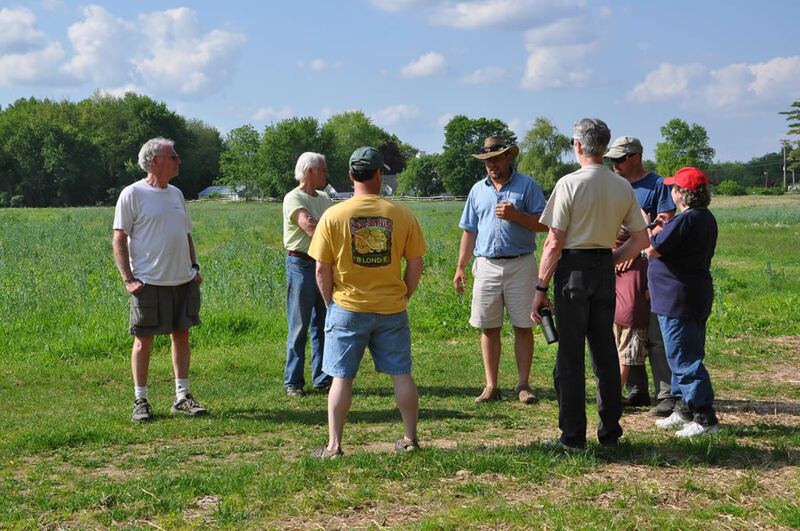 The Monadnock Community Land Trust (our landlord) held its annual meeting here at the farm on Sunday. After the procedural details were taken care of, we took a walking tour to inspect our operation. It may seem hard to believe, given how important food is to our lives, but farming does not pay well enough to compete with residential and other commercial uses for land these days. The cost of land has become disconnected from its ability to produce food–even though farm land is subsidized by relatively low taxes. Without conservation land trusts and other landlords willing to forgo a “market” rate in favor of farming, it would be nearly impossible to find affordable land to farm. Another way to look at this is that food today is incredibly cheap. It is subsidized both by the government and by landowners like MCLT. We should all thank MCLT for the dinner they help put on the table tonight! Yes it is true that food in the US is cheap. If we didn’t have organizations like Monadnock land trust, I wouldn’t be reading your website !